← I need a writing cave. A grotto. A… tent? As opposed to post apocalyptic. Have you read anything that takes place in and around the actual apocalypse, rather than in its aftermath? I’ve read World War Z, and Tomorrow When the War Began, and maybe Taronga back in school, but that’s about it. What are some good ones? I think my current plan is to self publish my sci fi series (when I ever finish any of it HOHOHO!) but write a “during the apocalypse” style series aimed at attracting an agent… Or would I be better doing it the other way around? What’s more marketable at the moment: space pirates or the end of the world? I started thinking about all this because of a particularly rad and interesting book I picked up: The Knowledge – How to Rebuild Our World from Scratch. It’s non fiction, and is a fascinating tour through all the tech we’d need to rediscover to get back from nuclear winter cavemen, right up to the age of computers and espresso (the real pinnacle of human development). How many people know how to make soap? What about steel? Glass lenses? Yeah we only know how to search Google and open the fridge, so we’d be back to the Stone age in fifty years, tops. 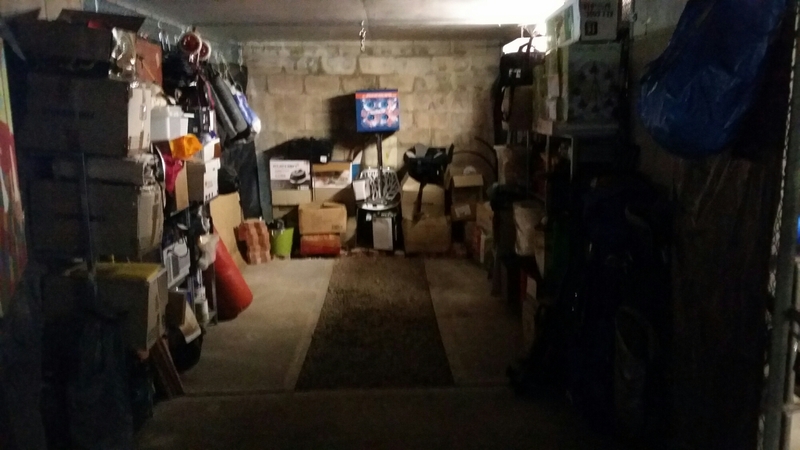 In non-writing news, I’ve cleared the garage (only took a year and a half) and put everything on new shelves, which allows me to do two things again: hang a punching bag (hook is rigged up from a metal pole I slung across), and setup the archery backstop at the far end. 8 Responses to What about just apocalyptic? Duh Midwich cuckoos. Damn autocorrect. Which ridiculous Tom Cruise movie? There’s so many! War of the Worlds? I will check out Wyndham, as mum told me to read them before and I still haven’t. That garage looks like a great space to create a man/writing cave. I’ll hang on to those rusty nails, then. I am thinking exactly the same as you: write to genre more agent-freindly and self-pub the more nichey (!?) sci-fi stuff. My thoughts are for a (non-Christian) book set during Jesus’s lifetime – that’s all I’ll say for now. You’re writing a sci fi epic version of Life of Brian? 😀 in seriousness though, historical fiction has definitely got more market, so you could be onto something there. Good luck with it! About genre, space pirates sounds cool (I’m thinking something like Serenity or Cowboy Bebop). Apocalyptic novels are a pretty crowded genre, particularly since people group those with dystopias. I’m not following my own advice on this, so take it with a grain of salt. Both genres mix well, though. When you say Forstchen’s politics are showing: do you mean politics as-in foreign policy, or US internal? It would be extremely irritating to be subjected to strong partisan politics crap, but some strong opinions on the motives of different nation-states I could take with a pinch of salt. You know, you’re kind of right about the Serenitys and the Cowboy Bebops (and the Guardians while we’re at it), there’s definitely a niche for the crew of spacefaring desperados. I wonder if it isn’t a genre more readily embraced in comics or film though?